PA State Rep. Garth Everett - Gun Law Seminars Begin Next Week -- Are You Registered? Gun Law Seminars Begin Next Week -- Are You Registered? The first of three free Gun Law Seminars, which I am hosting with Rep. Jeff Wheeland, will be held this coming Thursday, Oct. 18, at Mountain View Alliance Church. If you haven’t already signed up for one of the seminars, please click here to register. The informative events will include presentations from Lycoming County Judge Marc Lovecchio, who will discuss Pennsylvania’s Castle Doctrine and Stand Your Ground laws; Lycoming County Sheriff Mark Lusk, who will explain rules and regulations surrounding licenses to carry firearms; a police officer, who will discuss how to safely interact with the police when carrying a firearm; and an officer from the Pennsylvania Game Commission, who will discuss firearm carry laws as they relate to hunting seasons. • Thursday, Oct. 18, 6-8 p.m. at Mountain View Alliance Church, 1515 Cemetery St., Jersey Shore. • Tuesday, Oct. 23, 6-8 p.m. at Old Lycoming Township Volunteer Fire Co., 1600 Dewey Ave., Williamsport. • Wednesday, Oct. 24, 6-8 p.m. at Hughesville Volunteer Fire Co., 2 S. Railroad St., Hughesville. As a way to ensure students get the most out of their educational experience, the House passed legislation this week that would remove the heavy focus on standardized testing as a requirement to graduate. Students would be given various options to show proficiency in pursuing their own career paths. Act 77 of 2018 increased initial and annual training hours for Humane Society police officers and requires the training to include the proper procedure to file citations and warrants, including when and how to contact other law enforcement. Senate Bill 1090 is a comprehensive overhaul of the state’s anti-hazing law to give law enforcement better tools to prosecute hazing-related activities, and to encourage those nearby to call for assistance for someone who may need help. Last week, the House passed House Resolution 1048 recognizing October 2018 as “National Breast Cancer Awareness Month” and Oct. 19, 2018, as “National Mammography Day” in Pennsylvania. The American Cancer Society estimates that 268,670 women and men in the United States will be diagnosed with invasive breast cancer this year, and that’s why it is important to continue to educate the public about breast cancer and stress the importance of routine self-breast exams, regularly scheduled doctor visits and yearly mammograms as recommended. 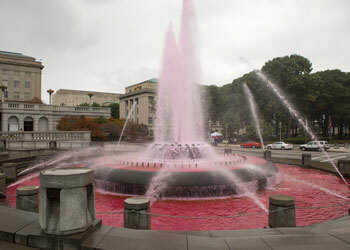 To honor those who have fought breast cancer or are fighting it now, the fountain at the Pennsylvania State Capitol’s East Wing was dyed pink for Breast Cancer Awareness Month. The pink fountain is also a reminder to all women of the importance of mammograms and early detection.